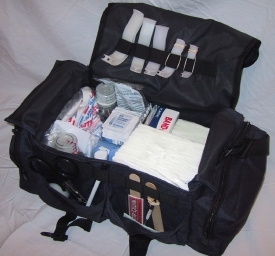 The 265 piece First Responder Kit is designed for use by those with first aid or emergency medical training. Contains basic first aid supplies plus blood pressure cuff, stethoscope and oral airways. The bag is 18 W x 7 H x 10 D.